Size: 754 sq.ft. - 1038 sq.ft. The Crest is one of the tallest two residential buildingsat Bhandup West location. The builder of these two multi-storeyed towers is Kalpataru Group Ltd.This complete project is covering area of 18 acres with ample space between towers and 60% space for project features. These Semi furnished apartments are available in various options from 2 to 3 BHK homes where the carpet area starts at 754 - 1038 Sq.ft. Crest's spacious accommodations are surrounded by various amenities, landscaped gardens which makes Kalpataru Crest a unique residential complex in itself. The revised completion date of Crest is December 2019. The Crest consists of two towers named as Aspire – "Wing A" & Avalon - "Wing B". Crest's spacious apartments are furnished with the imported outdoor and indoor things. It is having multi-floored towers with modern and elegant structure. These highly structured buildings are 36 floors high with high speed elevators. The abodes sizes ranges between 2 BHK & 3 BHK air-conditioned apartments. With exceptional designs the project comes with affordable price for its buyers & investors at 1.91 Crore (Approx) to 2.69 crore (Approx). This new addition to Bhandup West is attracting lots of buyers due to its location. It is at the highly developed location which has the key node to connect Easter express highway & Bhandup LBS Marg. The area lies well connected many industries like Asian Paints, BASF, CEAT Tyres and major IT parks in Vikhroli, Powai, Kanjurmarg, Airoli and on Thane Belapur Road. It is at the highly Kalpataru Crest offers easy access to the Eastern Express Highway and is also in close proximity to Nahur and Bhandup railway station. The major IT parks in Powai, Kanjurmarg, Vikhroli, Airoli and Thane Belapur belt. 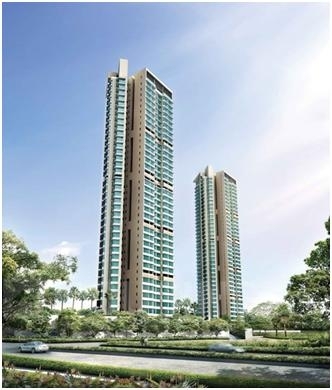 Kalpataru Crest towers are located near Asian Paints, LBS Marg in Bhandup West, Mumbai. Schools: - Pawar Public School & College, GS Shetty International School, St. Xavier’s High School & Junior College, Bombay Scottish. Shopping Malls: - R-Mall, shopping outlets like D-Mart, Shopper’s Stop, D-Bazar. Restaurants: -Pooja Restaurant, Aditya Pure Veg Restaurant, The food studio kitchen & bar. Movie Theatres: - PVR Cinemas, Cinepolis, Dreams Mall, Saaz Cinema, Big Cinemas. Banks/ATMs: -Axis Bank ATM, DMK Jaoli Bank ATM, State Bank of India ATM, Allahabad Bank ATM. Railway Stations: -Bhandup Station, Mulund Station, Kanjurmarg Station. Parks/Gardens: - Madhuban Garden, Matoshree Garden, Forest Park. 754 sq.ft. - 1038 sq.ft.